After playing 5 of their last 6 games on the road, and fresh off last week’s “Massacre at the Meadowlands,” the Ravens finally come back to B’More for some home cookin’ against the Philadelphia Eagles. The Eagles may be one of the few teams in the NFL that have had a rougher week than the Ravens. Not only did they manage only a tie against the lowly Cincinnati Bungles, but they have also had to deal with the media’s ridiculous obsession with the story about how nobody on the Eagles seemed to know that the game could even end in a tie. You can read PLENTY about that elsewhere, so we won’t spend any more time on it here, other than to say the Eagles might be more than a little PO’ed about being the laughing stocks of the football world all week. Luckily for us, the Ravens have their own issues to be angry about, so they should have no trouble matching the intensity out there. These seem like 2 teams that are passing each other in opposite directions. The Ravens feature a rookie head coach and a rookie quarterback, both of whom have already surpassed all expectations of them coming into this season. The Eagles, on the other hand, have a quarterback and a head coach who are both in their 10th seasons, and they currently find themselves in last place (by 0.5 game, thanks to that tie) in a division that they were expected to be near the top of. They have even been described as the “superior bad team.” Things can change quickly in the NFL, but as of today, the Ravens seem like a team on the rise, while the Eagles may be at the beginning stages of a bit of a decline as their gunslinger and head coach get older, and seemingly dumber, respectively. We say Andy Reid seems to get dumber, because at the beginning of the decade, when the Eagles went to the NFC Championship Game four consecutive times, Reid seemed to always be pushing the right buttons. This season, though, he has been endlessly scrutinized for his puzzling play-calling and decision making in general, with some even vehemently calling for his firing. The Eagles have been particularly bad in short-yardage situations – last week in Cincy, for instance, they Eagles were only 3/18 on 3rd-down, and passed on EVERY SINGLE ONE. Three of those were 3rd-and-1 plays! Hey, Ravens – the Eagles are going to pass – a LOT! It’s not like the Eagles are bad at passing, as evidenced by their 4th ranked passing offense. Quarterback Donovan McNabb, his performance last week notwithstanding, has had a pretty good year, throwing 14 TDs to 8 INT for a passer rating of 84.7. They have three very capable receivers in big man Hank Baskett, rookie speedster DeSean “Am I in the End Zone yet?” Jackson, and solid possession guy Kevin Curtis. Running back Brian Westbrook is also the best in the league at catching balls out of the backfield. The Ravens secondary will be tested, as the only passing offense they have faced all year with close to this potency was Indy, and we all know how that turned out. Their ability to get pressure on McNabb, and bring him down so he can’t move around and make plays with his feet will be critical to slowing down Philly’s aerial assault. Making the Eagles one dimensional will also go a long way in keeping them off the board. After being gashed for over 200 yards last week, the Ravens’ defense, and particularly their front seven, should be done licking their wounds and ready to get after it again. Westbrook is a slasher who does his best work in open space, a far cry from the between-the-tackles terror they saw last week in Brandon Jacobs. Running backs like that don’t usually fare too well against the Ravens, who contain the Willie Parkers and LaDainian Tomlinsons of the world with relative ease. Westbrook is also currently a bit hobbled by knee, ankle, and rib injuries, and even when healthy, Andy Reid has been inexplicably under-utilizing him. The Eagles will gladly make themselves one-dimensional with just a little prodding, so again, the Ravens’ secondary will need to be on their game. Defensively, the Eagles are no pushover. They are tied with Pittsburgh for the most sacks in the league with 36, and defensive coordinator Jim Johnson never met a blitz he didn’t like. Thirteen different players on Philly’s roster have recorded a sack, so the pressure will be coming at Joe Flacco from every angle. Defensive End Darren Howard leads the team with 8, but 4th-year DE Trent Cole (6 sacks) is the one that draws the double teams. The Ravens did a great job pass blocking against the Giants great rush, not allowing a sack until their final offensive snap. However, there is some bad news to report on that front: the Ravens offensive tackle situation is a bit muddled, as Jared Gaither is likely out Sunday with a shoulder injury, and Willie Anderson is still bothered by a bum ankle. The team resigned Chad Slaugher, who they had brought in during the preseason when the OL was still such a huge question mark. It may be him or rookie Oneil Cousins being forced into action against one of the best pressure D’s in football. Not good. Want some more bad news? We got ya covered. Derrick Mason has been out of practice so far this week with that shoulder injury suffered against Houston, and his status is very up-in-the-air. 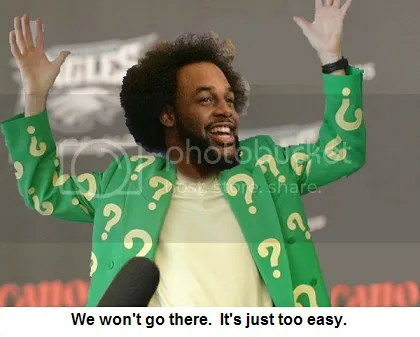 Without his #1 receiver, and security blanket, Mason, that blitzing Eagles’ D could look all the more dangerous to Mr. Flacco & Co. Cam Cameron will have to really earn his money this week trying to find ways to keep the Eagles off his young QB, and the chains moving (see: Package, Suggs). The Eagles are stout against the run as well, allowing less than 100 yards per game. The Giants ran for 219 on them 2 weeks ago, but we don’t take much from that, because as we learned, the Giants run on everybody. The Ravens’ three-headed backfield will need to rebound in a huge way from last week’s stinker, when Flacco led the team in rushing. None of the three are on the injury report thus far, so as long as there is somebody up front to clear some holes, they need to be able to find them. At least the intangibles should work in the Ravens’ favor this week. The Ravens are 3-1 at home this season, while the Eagles are 2-2-1 on the road. B’More allows under 11 ppg at M&T Bank, while the Eagles have given up 22 ppg on the road. Their “non-losses” away from Philly have come to teams with a combined 6-23-1 record. But wait, the Ravens home wins have come against teams with a combined 7-22-1 record. So scratch that one. Hmm…ok, heres one. John Harbaugh was an assistant coach in Philly before coming to B’More, so he has some inside info. Without looking up the numbers, Coaches seem to do pretty well against their former teams, right? We’re going with yes. A healthy Ravens team would have no trouble with the Eagles at home. But the injuries, especially those to Gaither and Mason, give us pause. If those two can’t go, they are at least worth a touchdown and some field position, so this one could end up a bit hairier than we would like. This entry was posted on November 20, 2008 at 2:13 pm and is filed under Ravens, Ravens Game Previews. You can follow any responses to this entry through the RSS 2.0 feed. You can leave a response, or trackback from your own site. What you won’t see Sunday: The Ravens give up 27 points at home. Sorry, man. haha, chestfinder its pretty funny you picked a tie last week…you had the right weekend, just the wrong game.